Rather than the usual golf days and office team building outings, Adventure Cheshire at Catton Hall has been hosting a different, more exciting, Corporate Team Building Away Days for over last 30 years. One of our biggest clients over the past few years has been Whitford Worldwide. 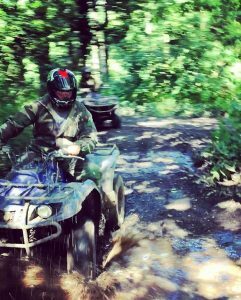 This is always a day with a difference, one to one Clay Shooting, Quad Biking, Archery through the woodlands and 4×4 Driving or Rage Buggies. Every year we add a different activity which we may even outsource as we work closely with other providers to keep it fresh and new. The later part of the day ends firstly with a 5 man flush, basically a fast clay shooting fest of several targets all appearing randomly in the sky whilst 5 shooters try to hit as many as they can in their team! We tend to follow this with a fast fun team game and this year we created a obstacle course incorporating our game ‘Gutter Ball’ where the team had to transfer a tennis ball around the course with equipment provided. A panic frenzy race between all the teams ended up in a lot of laughter and a perfect ending to the day! McEwan Wallace are popular customers year on year too. Their days often circulate around a Clay Shooting Competition rather than a multi activity day. A mix of experienced and beginner shooters compete together with our fabulous professional instructors over several stand so that they get a real taste into Clay Shooting and to see many different targets as well as some competition stands to test them. NG Bailey and Briggs & Forrester have their Shooting Events yearly where they bring customers and clients to enjoy a days shoot followed by an evening meal and a free bar! Award ceremony with trophies and prizes for individual winners and team winners as well as a raffle for charity at the end with some of the best prizes we have even seen, TVs, Mountain Bikes, Ipads, Computers the lot! Rentokil run specific training days yearly where the Air rifle Range becomes a training facility instead of just for fun! We are often asked to adapt our usual days to suit our clients needs and we pride ourselves on the fact we can give exactly what they want by offering a bespoke tailor made event. 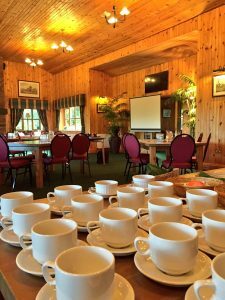 Our events are centred around our fabulous Scandinavian style Shooting Lodge. Our facilities are second to none and a perfect centre point for the days events. Our resident Chef caters for all needs in the kitchen and we will bring in exactly what the customers wants. The licensed bar is opened once activities have finished so that everyone can enjoy a drink on the veranda at the end of the day! 10:00am – 25 Practice Clay Shoot over 5 Stands followed by a 25 Competition Clay Shoot. This year do something different with your business and give them a day to remember! A guaranteed day of fun and excitement whilst bringing your workforce closer together or a reward for clients or customers.